By default when running the Links > Reports or Links > Audit Links and Bookmarks features in Debenu PDF Aerialist bad web links (URLs) are not checked. This is due to the increased time that it takes to validate whether a web link (URL) is working or not (it must follow the web link to the responding server and validate whether the returned HTTP status code is valid). However, it is possible to change this behavior so that web links are checked in the preferences section for Debenu PDF Aerialist. 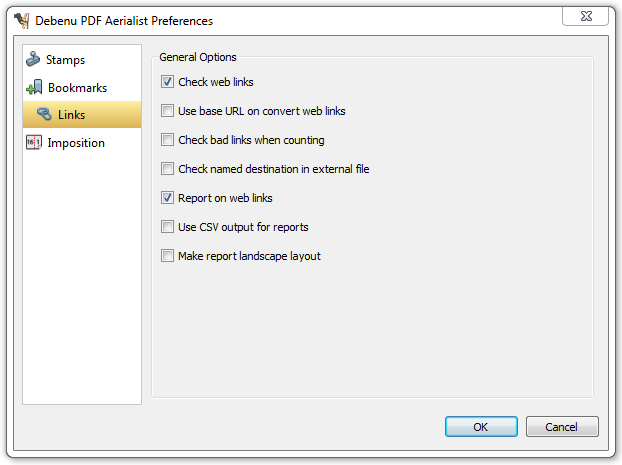 Once the Preferences dialog is open select the Check web links option and select the Report on web links option. Web links will now be validated in your PDF documents when you run the link reporting or auditing tools in Debenu PDF Aerialist.